Today we’d like to introduce you to Andy Milas. Thanks for sharing your story with us Andy. So, let’s start at the beginning and we can move on from there. Esthema’s story dates back to 2006 when I started composing what would become the tracks for our first CD, Apart From The Rest. At the time, I was playing/managing a traditional Greek band. We played all types of functions across New England and New York however after two decades, I wanted to start working on my own music again. Before I did the Greek music thing, I was mostly playing what was considered progressive metal but I grew up with Greek music all around me and in the summer of 1990 I joined a Greek band. The rest is history, including marrying the singer. The music that I started writing definitely had elements of Greek music but it also contained the elements of the prog rock/metal that I once played and continued to listen to and many elements of jazz and fusion that I had been studying for years. Once I had a few compositions written, I started looking for musicians. I knew I wanted to find guys that could do the traditional Greek, Balkan, and/or Middle Eastern music thing but I also wanted to capture elements of progressive rock and metal, as well as jazz. Through a Balkan clarinetist that auditioned (and ended up not having the time for a project) I met violinist, Onur Dilisen who aside from myself is the only original member still with Esthema. Educated as a classical violinist in Turkey and in the US, Onur was born in Turkey and was/is a closet metal head. He was perfect (and still is)!!! To date, Esthema has released three successful and critically acclaimed CDs, Apart From The Rest (2007), the Hereness and Nowness of Things (2009), and Long Goodbye (2014). The current line-up consists of myself (guitar), Onur Dilisen (violin), Mac Ritchey (bouzouki, oud), Tom Martin (bass) and George Lernis (drums, percussion). This same group, which was featured on Long Goodbye is heading back into the studio this fall to begin recording Esthema IV (working title). I don’t think anyone can say music is a smooth road but each struggle becomes an opportunity for something more. I think Esthema’s biggest struggle is the fact that we play a style of music that is very difficult to categorize. Terms like World-Fusion, Progressive Instrumental, Cinematic, World-Beat, have all been used to categorize what we do however when you can’t put it into a neat box then marketing becomes a challenge. I said that each struggle becomes an opportunity for something more because over the years we have had such challenges in marketing the ensemble that we have reached the point where we don’t worry about marketing. This in turn has given us complete freedom. We don’t worry about the length of the compositions, the structure, the time signature or anything like that. We only worry about whether we are writing something that is a part of us. This of course brings on its own residual struggles, but the alternative isn’t worth it. Esthema is an acoustic instrumental ensemble fusing progressive rock and jazz-fusion with the sounds of the traditional music of the Balkan region and the Near & Middle East. Please tell us about Esthema. 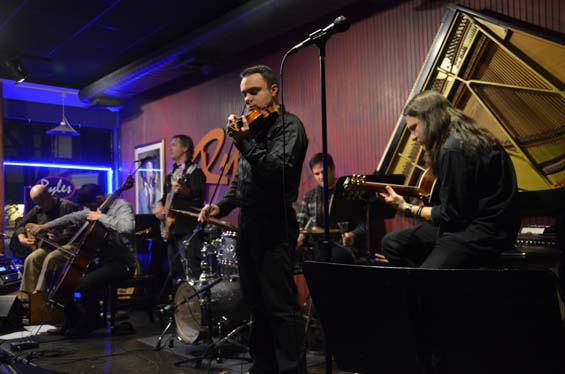 “Esthema is a Boston-based ensemble composed of virtuoso musicians that defy musical boundaries,” writes Angel Romero in Progressive Rock Central. A progressive music ensemble hailing from Boston, MA (USA), Esthema has been creating their unique sound since 2006 by fusing progressive rock and jazz-fusion with the sounds of the traditional music of the Balkan region and the Near & Middle East. The musicians that shape the sound of Esthema bring together both western and eastern influences, instruments, and concepts creating a musical tapestry that transcends musical genres and cultures. Since the release of the Hereness and Nowness of Things, Esthema has been in the weekly Top 20 at Latch Fusion Radio alongside Fusion greats like Herbie Hancock, Return to Forever, and the Mahavishnu Orchestra, they have been nominated and won the Top 25 of 2011 Award at Indie-Music.com and their composition “Eastern Dance” went to number 4 on the Instrumental Charts at Indie-Music.com and on September 20, 2010 the International Association of Independent Recording Artists (“IAIRA”) certified Esthema’s “Eastern Dance” as an International Top 10. Compositions from all three releases can be heard on radio programs and stations throughout the United States, Europe, and Turkey. We only get one chance at life and each experience that we have. To say that I would change anything is difficult because I don’t know what that outcome be. I like where Esthema is at. Would I want us to be more successful? Of course, but how one measures success becomes the looming question.